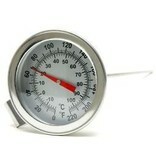 This handy dial thermometer works great for keeping track of your brewing temperatures. You can use it to track your mash, to monitor your temperature when boiling malt extract, or to bring sparge water to the correct temperature. The 2 inch dial face is easy to read with clear temperature graduations and numbers, so you can take readings with a glance. The probe stem measures 9 inches long. 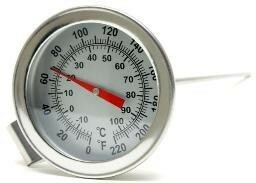 This dial thermometer easily attaches to the rim of any brew pot with a handy clip. You can keep as much of the probe in the liquid as you like by adjusting the clip. The clip also keeps the probe out of the way while you brew.